Reception with the artists: Sunday, October 18, 3:30–5:30 p.m. Planned to coincide with the Jewish High Holidays, this exhibition of 15 works by nine contemporary artists surveys both the historical and present impact of judgment, forgiveness, oneness and remembrance on individuals and communities through the lens of contemporary art. Derfner Judaica Museum is located in the Jacob Reingold Pavilion at 5901 Palisade Avenue in the Riverdale neighborhood of the Bronx, NY. Works on view represent a range of media, including painting, drawing, photography, collage, silkscreen and linoleum printing, textile and assemblage. Using photography, artists Aileen Bassis and Dennis RedMoon Darkeem create autobiographical works informed by their childhoods in the Bronx; Robert Kirschbaum and Elyssa Wortzman approach the biblical story of the Sacrifice of Isaac, associated with the Jewish New Year liturgy, through the medium of abstraction; both Alexis Mendoza and Ken Goldman evoke Dada and Surrealism in their curious juxtapositions of objects and materials; Joyce Ellen Weinstein’s print and Anne Kantor Kellett’s sculpture draw inspiration from their experiences in Poland and Rwanda, respectively; Laurie Wohl’s textile, embroidered in Hebrew, Arabic and Greek, evokes a hope for reconciliation and oneness. Museum hours: Sunday–Thursday, 10:30 a.m.–4:30 p.m.
· Ken Goldman’s plastic, 3D-printed Selichot–Schulklopfer–iPhone dock, 2015, updates the traditional wooden synagogue knocker orschulklopfer used to bang on congregants’ doors to awaken them for the early morning prayers for forgiveness (Selichot) recited during the period leading up to the holidays of Rosh Hashanah and Yom Kippur. Designed as an iPhone dock, the user can set an alarm and, with the help of a shofar app, wake to the sound of the ram’s horn instrument (shofar). Goldman was born in Memphis, Tennessee, in 1960, and lives and works on Kibbutz Shluchot in Israel. 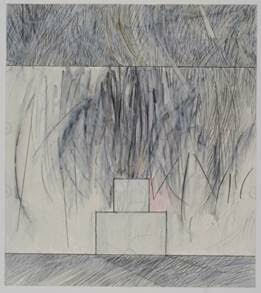 Robert Kirschbaum, Akedah #40, 2008-2009, mixed media on paper, 9 x 8 inches. Courtesy of the artist. · Robert Kirschbaum is represented with three drawings from his series Akedah, 2008–2009. Awareness of the centrality of exile to the Jewish experience has led Kirschbaum to internalize the ideal of return and the miracle of redemption. His richly and vigorously drawn, yet precise geometric and architectonic forms, evoke the Temple’s destruction and mythic recreation. Kirschbaum was born in Manhattan in 1949; he divides his time between New York City and Hartford, Connecticut. · Joyce Ellen Weinstein’s print, Blind Leading the Blind with Yellow Cross, n.d., grew out of time spent in Vilnius, Lithuania, during an artist residency. While there, she observed and photographed employees from a local furniture factory practicing trust and bonding exercises. Viewed afterward, the images suggested mysterious, even ominous,interpretations that inspired her work. Weinstein was born in New York City in 1940, and lives and works in Manhattan. Laurie Wohl, Will There Yet Come? A Grain of Hope, 2015, detail, Unweaving® fiber art, 35 x 43 inches. Courtesy of the artist. · Laurie Wohl’s Will There Yet Come? A Grain of Hope, 2015, is a textile with a spiritual narrative, alluding to the form of a traditional Jewish prayer shawl (tallit). 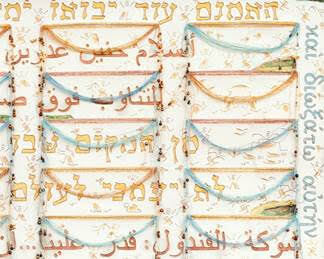 Embroidered in Hebrew, Arabic and Greek, and building on texts from Micah, Psalms and Peter, they include the words of poets Leah Goldberg, Yehudah Amichai, Mahmoud Darwish and Samih al-Qasim that evoke themes of oneness and reconciliation. Wohl was born in Washington, D.C., in 1942, and lives and works in Manhattan. · Elyssa Wortzman’s abstract painting Sacrifice, 2012, takes as its subject the traditional sacrifice ritual of the Akedah, or Binding of Isaac (Genesis 22: 1-19), in which Abraham is asked to sacrifice his son Isaac, a story that is read on the second day of Rosh Hashanah. According to the artist, the painting represents the ritual shrouded in a mysterious cloud of smoke, suggesting a space into which the viewer may project his or her individual sacrifice and offering. Wortzman was born in Toronto, in 1970, and lives and works in San Francisco. · Aileen Bassis is represented with a selection of four archival inkjet prints from her series, Stories End, 2012. In the series, she digitally altered, combined and re-photographed images of a real book, Jewish Fairy Tales and Legends, with her own photographs of former Bronx synagogues. Bassis was born in New York City in 1949, and grew up in the South Bronx. She lives and works in New Jersey. · Dennis RedMoon Darkeem’s Star of the RedMoon, 2014, is an autobiographical work infused with cultural memory created from photographs and designed into a Native American Indian star quilt pattern. It is representative of the traditional patchwork of many Native tribes in the Southeastern United States who used old scraps of European fabrics to create blankets and clothing. Darkeem was born in the Bronx in 1982, and also lives and works in the borough. · Anne Kantor Kellett’s sculpture, Gloibn, 2012, meaning “believe” in Yiddish, is intended to be viewed from the back as well as the front. The back of the head reveals points of vulnerability, at once resilient, yet scarred, and was influenced by her being the daughter of Holocaust survivors. A second work, Rachmones, 2011, which means to have mercy, was influenced by Kantor Kellett’s travels to Rwanda. Kantor Kellett was born in Brooklyn in 1949. She lives and works in Bucks County, PA.
Alexis Mendoza’s Untitled,2015, is from his recent series of works, Time and Place, in which vintage or antique furniture symbolizes a living representation of the past, the acceptance of pain—the steel nails hammered into the seat—and the notion that one must go on, forgive and forget. Mendoza was born in Havana City, Cuba, in 1972, and lives and works in the Bronx. Hebrew Home at Riverdale by RiverSpring Health is committed to publicly exhibiting its art collection throughout its 32-acre campus, including the Derfner Judaica Museum and a sculpture garden overlooking the Hudson River and Palisades. Derfner Judaica Museum + The Art Collection provide educational and cultural programming for all visitors, including residents of the Hebrew Home, their families and the general public who come from throughout New York City, its surrounding suburbs and elsewhere.